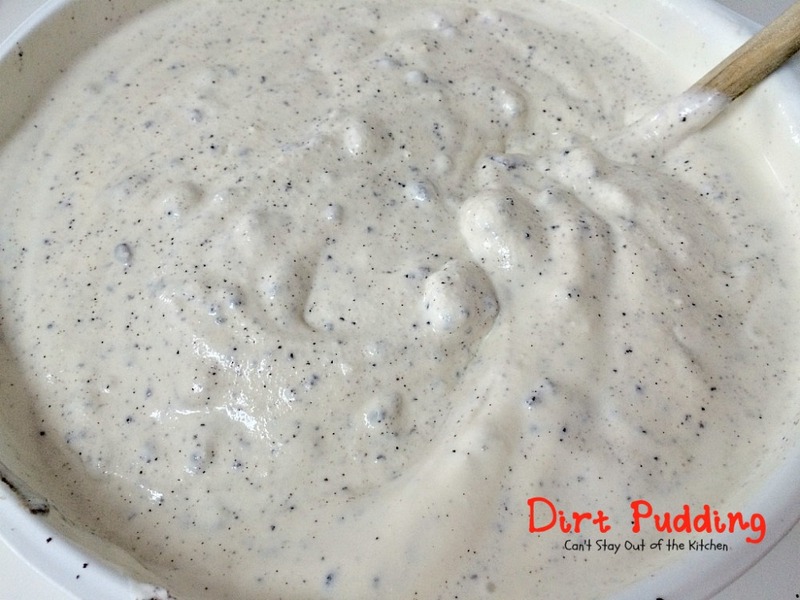 I know Dirt Pudding doesn’t sound like it would be a sensational recipe, but it is! This quick and easy 3-ingredient dessert combines Double-Stuffed Oreos, non-dairy whipped topping and Blue Bell vanilla ice cream. It is soooooooo simple. 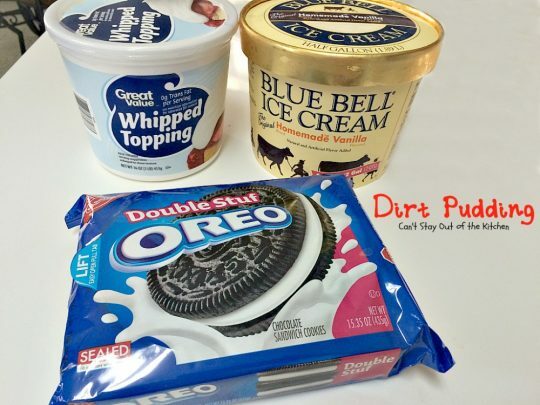 All you have to do is melt the ice cream, stir in the whipped topping and crushed oreos and stir. Pour into a bowl and sprinkle a few more Oreo crumbs on top. Then refreeze. Really. It’s that simple. Waiting for the ice cream to melt takes the longest time in this quick and easy recipe. 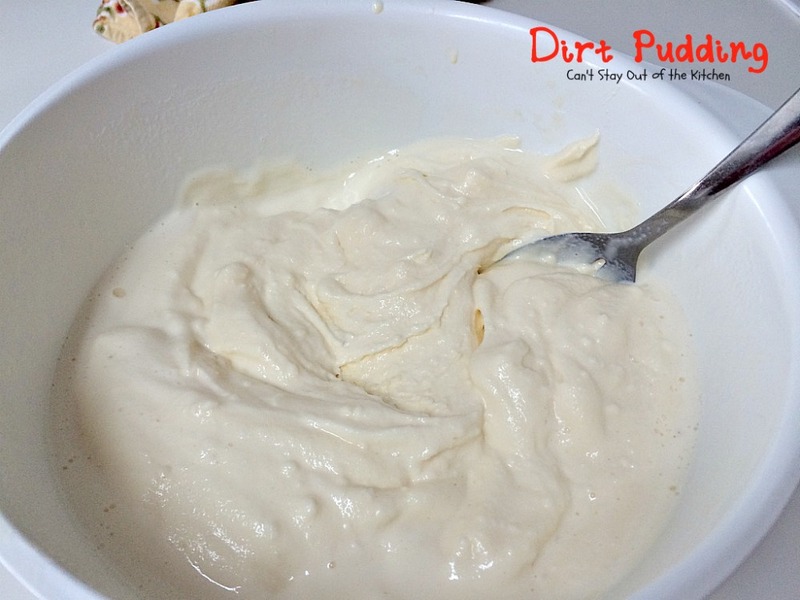 Dirt Pudding is a fantastic recipe to serve to company. For that matter, you can use just about any kind or any flavor of ice cream. If you use a different flavor of Oreos like the orange creamsicles, this recipe would work great with an orange creamsicle ice cream or even sherbet. You can use the basic recipe with almost anything. Years ago, in early 2000, I was working at the Baptist Convention of New England when my kids were finishing up school. We had a party there one day and Cindy Zoller, who I used to attend church with at Southwest Baptist Church in DeSoto, also worked there and brought in this great recipe for that party. I HAD to have the recipe. When she told me how easy it was, I couldn’t believe it. I haven’t made this recipe as much as I probably could have over the years. I’ve made it a couple of times but forgot about it until I was looking through my cookbook a couple of weeks ago. I promptly bought the ingredients so I could make it for our Sunday evening care group at our church. This group consists mostly of young couples (so we are like parents to many of them). We have a true potluck (nothing planned) every Sunday evening for dinner. Sometimes we have all desserts, sometimes we have a variety of finger foods, some times it’s something easy like fruit or even Animal Crackers! There are lots of little ones running around so we have to provide food for every appetite. I brought this to our care group a couple of weeks ago and everyone loved it. There was some left over they asked me if I would bring it the following week also! Even the guys loved this dessert asking me what was in it. Everyone kept going back for more until it was cleaned out. As you can see from the pictures below, this recipe makes a lot. While the amount on the recipe card is 12, depending on the size scoop you use, you may be able to stretch this to 20 or more servings, especially if you’re serving more than one dessert. Dirt Pudding is one of the easiest desserts you’ll ever make. 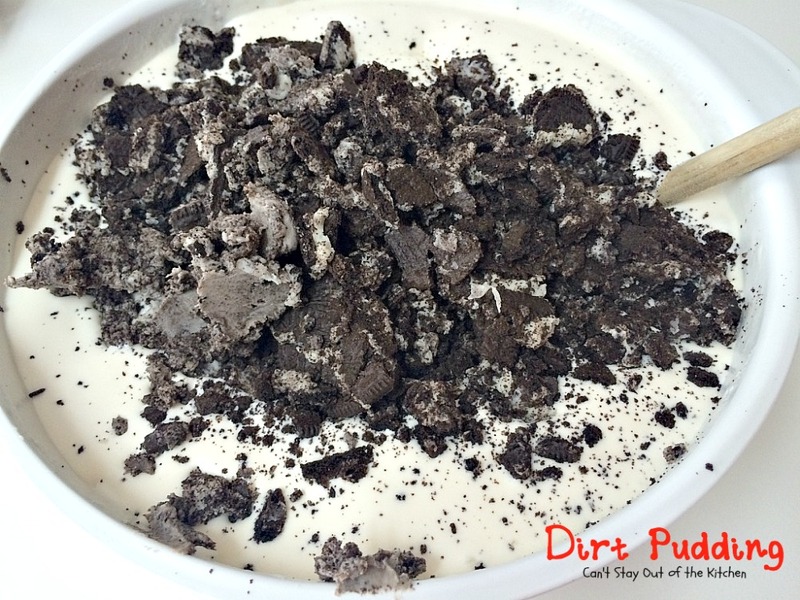 If you enjoy ice cream desserts, you’ll love Dirt Pudding. Oreos and ice cream go so well together. Soften ice cream by setting it out on the counter for 30-60 minutes. Meanwhile, crush Oreos in a zip lock back with a rolling pin. Using a knife or spoon, scrape out all the crumbs and icing into a bowl. Set aside. 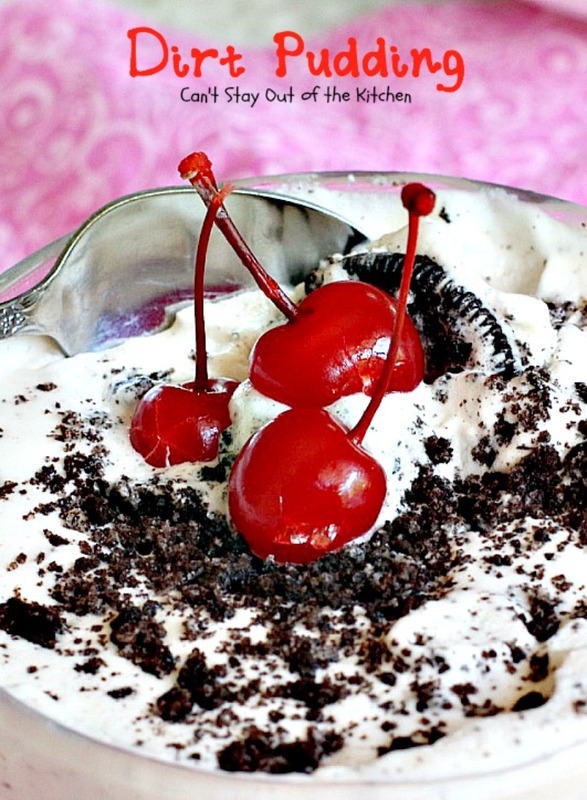 Place softened ice cream in a large mixing bowl. Add part of the Oreo cookie crumbs. Pour mixture into your serving bowl. Sprinkle with remaining Oreo cookie crumbs. Freeze a few hours until totally frozen. 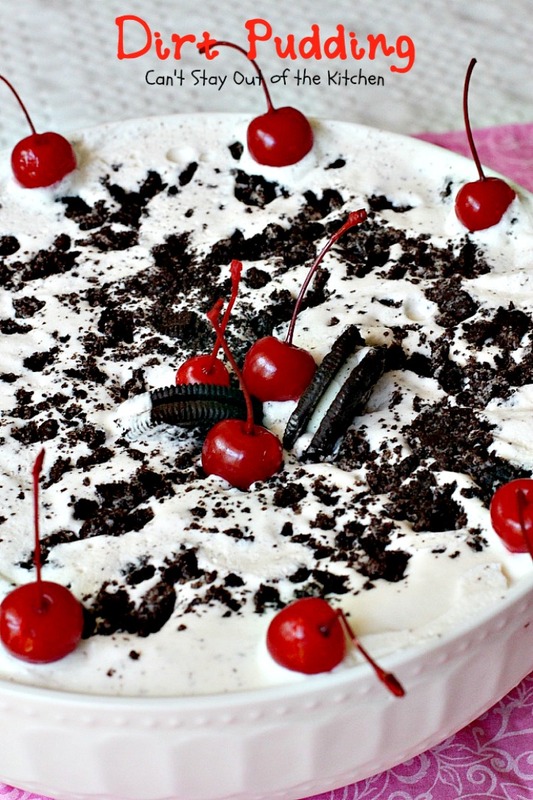 If desired, garnish with Oreo cookies and maraschino cherries. 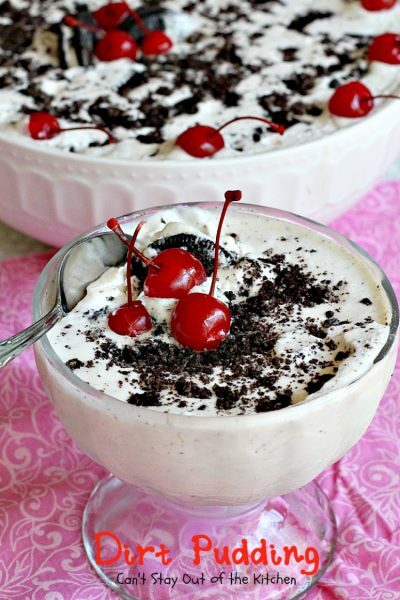 (Do not try to garnish ahead of time or the cookies and maraschino cherries will sink into the dessert). Serve Dirt Pudding in bowls or parfait dishes. This lovely dessert is fabulous for the holidays, plus it's so easy since it uses only 3 ingredients. Don't let the name fool you, Dirt Pudding is spectacular! Put ice cream in a large bowl and let melt until it gets mushy. Add cool whip or non-dairy whipped topping. Crush oreos (place in a ziplock and pound or roll with rolling pin). Reserve about ½ -3/4 cup oreos for topping. 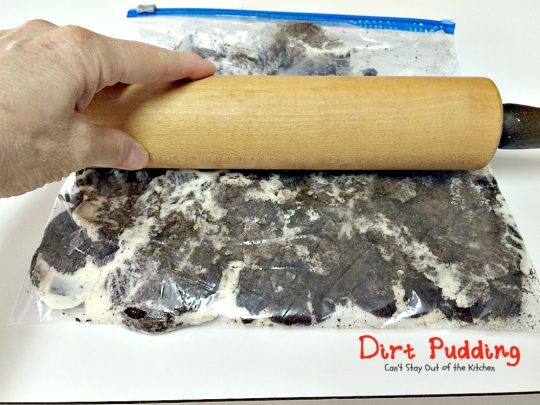 Fold remaining oreos into ice cream mixture. 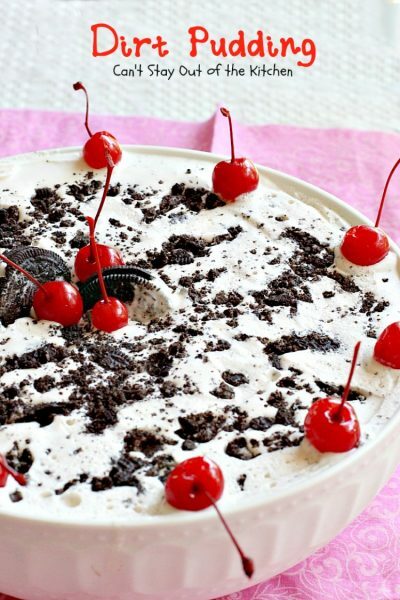 Sprinkle oreo crumbs on top. 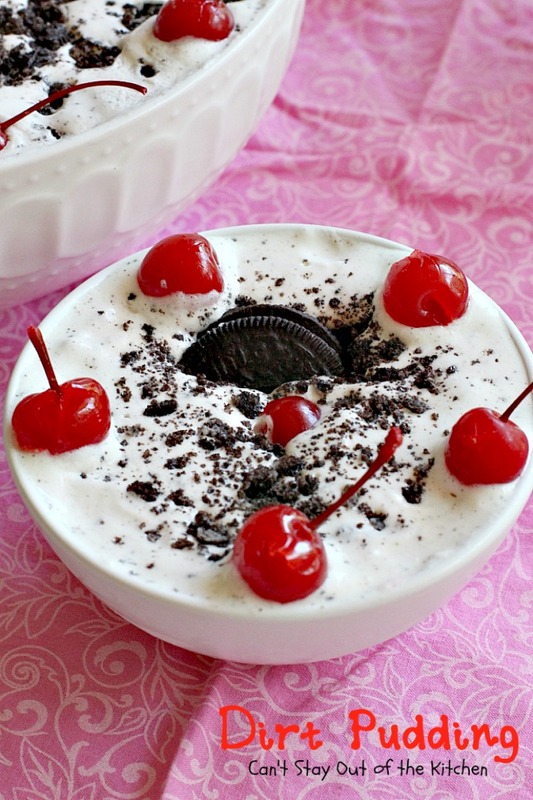 NOTE: If you choose to garnish with Oreo cookies and maraschino cherries on top, you will need to freeze the dessert completely beforehand. Otherwise the cookies and cherries will sink into the pudding and disappear! NOTE: Preparation time does not include time required to soften ice cream. This lovely dessert is fabulous for the holidays, plus it’s so easy since it uses only 3 ingredients. Don’t let the name fool you, Dirt Pudding is spectacular! If you choose to garnish with Oreo cookies and maraschino cherries on top, you will need to freeze the dessert completely beforehand. Otherwise the cookies and cherries will sink into the pudding and disappear! [br][br]Preparation time does not include time required to soften ice cream. 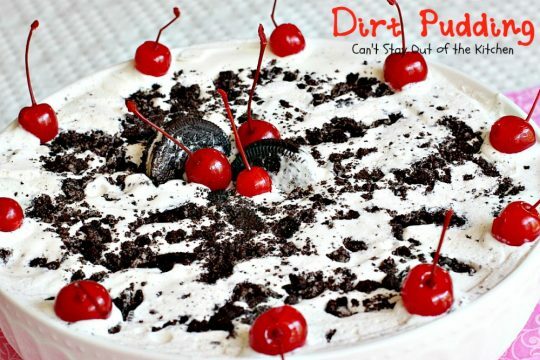 Everyone will rave over this Dirt Pudding dessert. 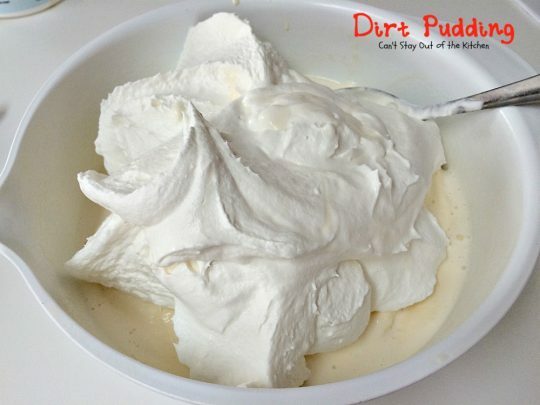 Dirt Pudding is a great dessert to make for the Christmas holiday season and parties, Valentine’s Day, or for other special occasions like birthdays or anniversaries. I’m sure you’ll love it, Kim.